Any great manager worth his salt will tell you that their greatest business asset is good relationship with their customers. While this is true, focusing only on customers while ignoring your workforce will only create gaps through which troubles march in. Use Social CRM to plug the gaps. With dramatic reach of mobile and web communication technology, many businesses have turned to the use of social media tools and services to effectively engage with their customers and workforce at the same time. Social CRM used in fully networked companies has been proven to be a catalyst for product development, marketing and customer service. 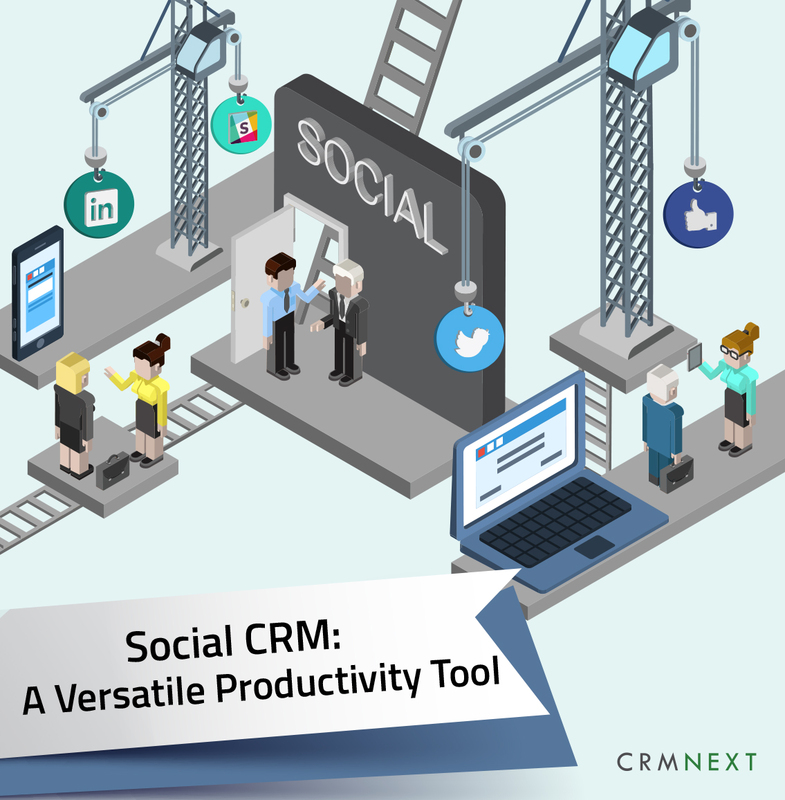 The versatility of social CRM can be attributed to the fact that social is all about easy and quick communication and more important, collaboration. Social CRM can be used for brainstorming and creating marketing campaign blueprints, managing sales processes, project management, getting additional customer insights etc. Take a look at a Mckinsey finding below. Businesses with CRM solutions can easily facilitate collaboration and communication across its various functional units. There is complete visibility and accountability. Social CRM tools is also a conduit for a customer-oriented sales cycle with active participation of sales team members. 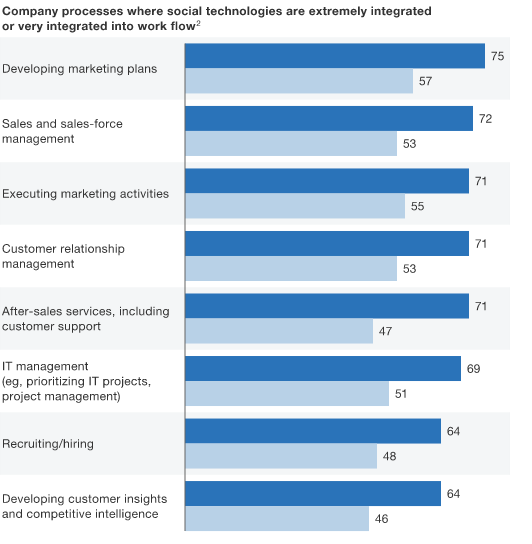 Transparency between organizational silos is increased and the open feed between support, product and sales permits for streamlining of the business process, thereby, increasing productivity. Social tools inbuilt in CRM solutions also help businesses collaborate with colleagues around the world and across the enterprise easily and quickly. This easy and quick communication allows the business to benefit from the combined knowledge trove of the company from its various stakeholders. It is a common refrain of companies that it is almost impossible to measure tangible impact of social initiatives. Social CRM tools negates that complaint. 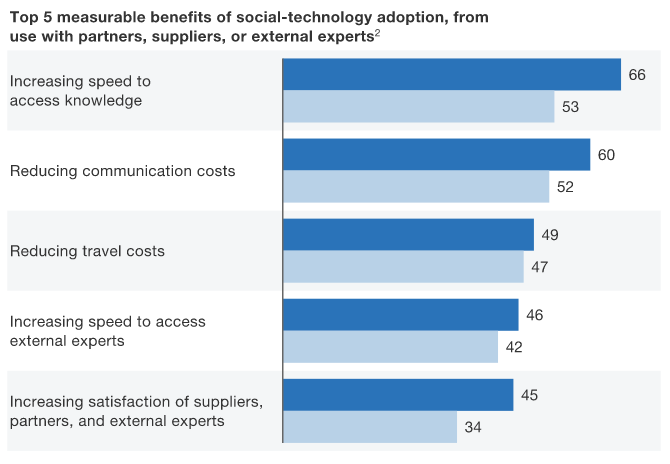 With the accumulation of big data from multitude of internal messages and interaction history, companies can study the conversion impacts of various social initiatives. This has the added benefit of enabling the sales team members to understand the needs of the customers who wish to understand the marketplace. The use of sophisticated analytics inside social tools allows businesses to be on the ground and drive clear communication to their employees. This, in turn, enhances good relationships between businesses and their customers. Social CRM platform is mostly being used in data analysis. Decision making is customer-based and strategic since it is based on real time monitoring, reporting and analytics. By tracking variables such as customer behavior, business teams can easily determine when to act. It is perhaps, no surprise then, the following statistics emerged from another Mckinsey study. It is an incontrovertible truth that social tools help businesses to listen to the voice of customers and discover their influencers and trends. This method is more cost-effective than the traditional model, cutting costs and thereby improving productivity. Bring the power of social communication into your workplace and see your business intensify by enabling conversations. This gives stakeholders to participate in meaningful engagement that transcends borders. Businesses with the help of social CRM, can take the bull by the horns on ideas, opportunities and recommendations in social sphere. 3. How to Perfect Your Social CRM Strategy?